Elliott Carter’s remarkable Indian summer lives on. 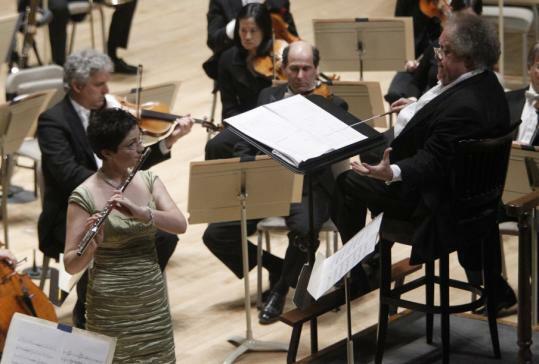 Last night in Symphony Hall, soloist Elizabeth Rowe and the BSO under James Levine’s baton delivered a triumphant first American performance of Carter’s Flute Concerto, completed in early 2008, when the composer was 99 years old. Carter had had many requests for flute concertos over the years, but he has always demurred, as he wrote in a program note, “because the flute could not produce the sharp attacks that I use so frequently.’’ But then Carter entered what has been called his “late, late’’ period of composition, a time of occasional mellowing, softening of edges, and thinning out of orchestral textures. Some have even heard a certain Mozartean lightness and transparency. Carter also has shown the potential to completely surprise his audiences, pulling out of his hat utterly uncharacteristic pieces such as “Sound Fields’’ premiered at Tanglewood in 2008. He also obviously changed his mind about the flute, and has now upended expectations once again, writing a rigorous yet in its way ravishing concerto that seems to have been inspired by, of all things, the flute’s lyrical possibilities. Many hallmark Carter gestures can still be heard in the pointy and mercurial orchestral writing, the taut and rapid interplay between soloist and ensemble, and the kind of sharp-edged virtuosity demanded of the soloist at certain points. But the work’s heart, its central section, is dominated by a striking ruminative songfulness, with long solo melodies that meander and drift through different registers while the orchestra offers only modest commentary, or later, icy chords slowly drawn to arresting effect. The work ends with a burst of pure adrenaline. Carter has written what amounts to, within his high-modernist oeuvre, a real crowd pleaser. Rowe, the BSO’s principal flute, did marvelous work last night with the solo part, darting through the dense passages with poise and remarkable agility but also taking full advantage of the work’s lyrical opportunities with grace and tonal warmth. As the applause began afterward, heads swiveled and murmurs of “is he here?’’ could be heard in the audience. It turned out the composer, now 101, was quietly beaming in row M. As he stood up, so did the entire Symphony Hall. For Levine, it seems, a Brahms symphony feels right for just about any occasion, and this program ended with a robust and high-energy reading of the Fourth. Levine’s chosen opener, excerpts from Schubert’s incidental music to “Rosamunde,’’ turn up less frequently, but the unhurried elegance and tonal refinement of last night’s performance made you want to hear them again. James Levine conducted the Boston Symphony Orchestra in Brahms Fourth Symphony at Symphony Hall on Feb. 4, 2010.